playing with bits and pieces. 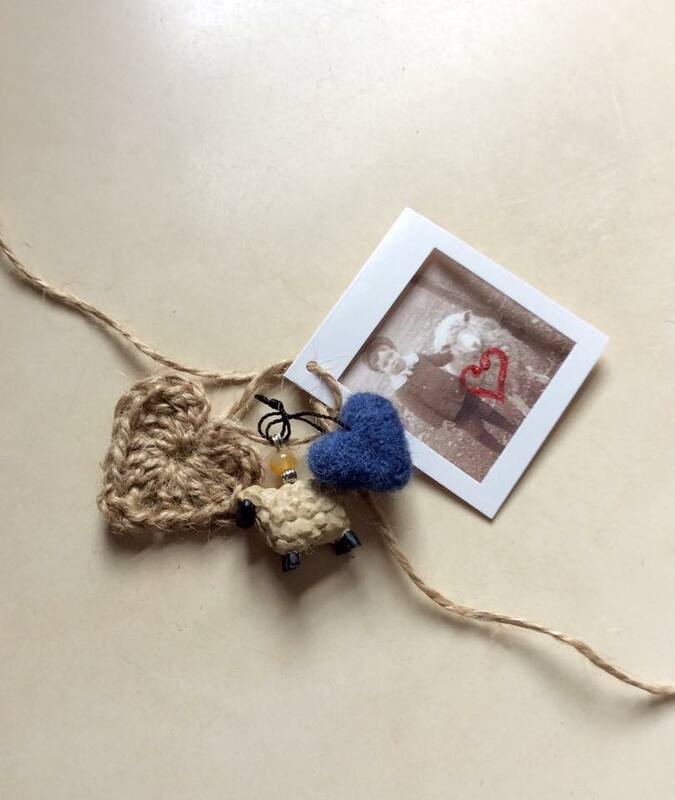 Crochet a little heart with simple twine. Needle felt a tiny heart with some hand-dyed wool roving. 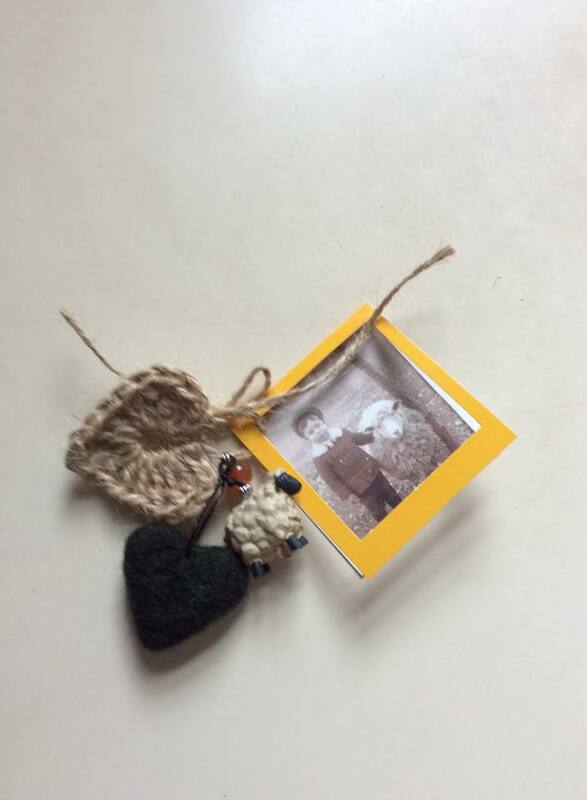 Add a bead or two; copy a vintage photo onto card stock. Play. Stay warm. Mix it up. Sweet sheepy sentiments. 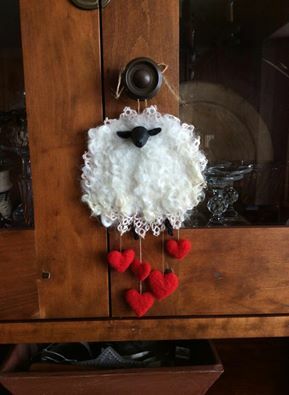 Gift to a fiber/sheepy friend. Smile. I have a collection of doilies, some that are crocheted by my mother (who will be 90-years-old on Feb 9th) and others (some mass-produced) that I have accumulated over time. I was ‘inspired’ to DO something with them. 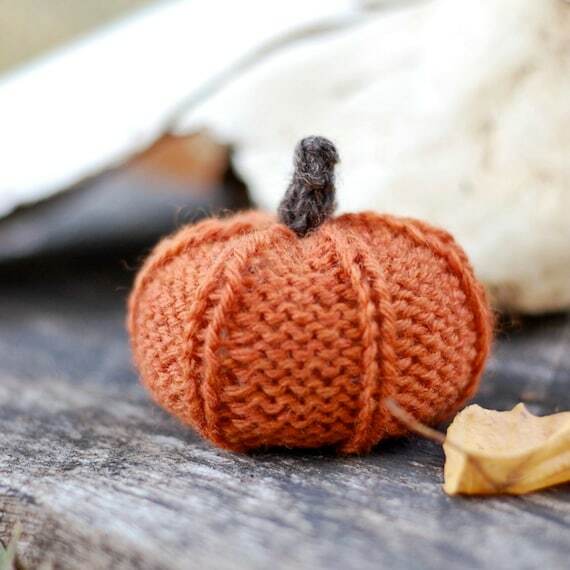 I often sharing quickie projects that are easily accomplished by beginners, both children and adults. This little cutie (found on pinterest) has always tickled my fancy! It is a lovely ‘project’ on its own merit. 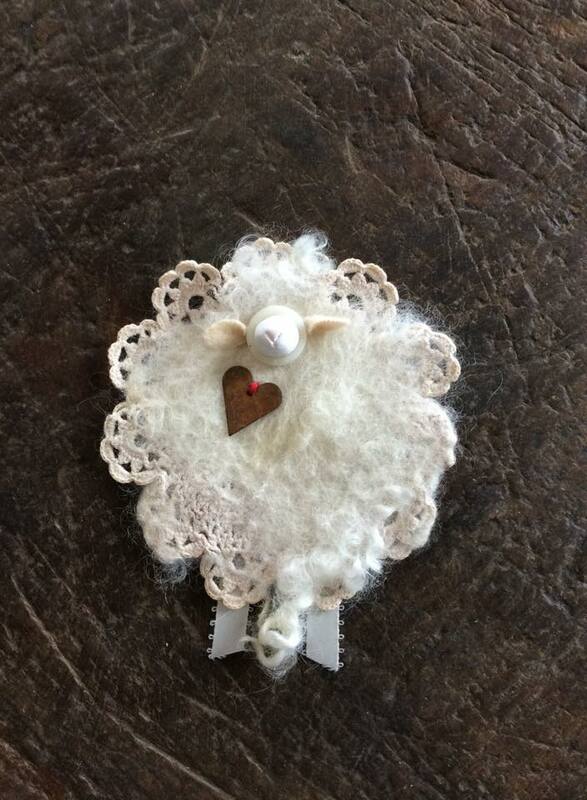 They are very sweet simply hanging in a window or gathered together in a sheepy garland! But, since I have an overflow of farm-raised wool fleece at my fingertips, I came up with the idea of sandwiching (is that a word?) 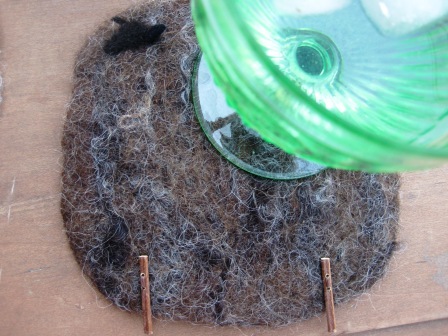 a crocheted doily between layers of wool and then wet felting them together. The wool and crochet lace/yarn provides another interesting facet and layer of texture. And you know I’m all about texture!! I think I’m most fond of the black-faced sheep. Naturally, you may embellish to your heart’s content… whatever little trinkets you have on hand in your stash/junk drawer. Buttons, ribbon, found jewelry bits, rusted hearts, beads, notions and so on and on. 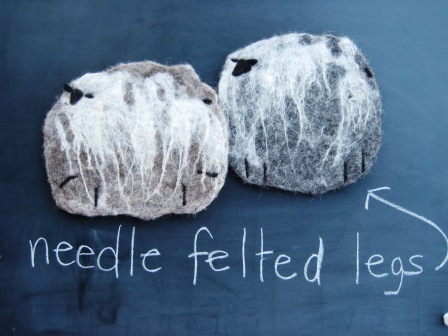 You may use felt for the face and legs detail, or needle felt a 3-D head for some sheep? This time, I actually used a little clay to sculpt a head and hand-painted them with a little art paint. I stitched a vintage button to the ‘body’ and then glued the clay head to the button. But, you decide… they are your creations! What a sweet gift for someone special on St. Valentine’s Day?? 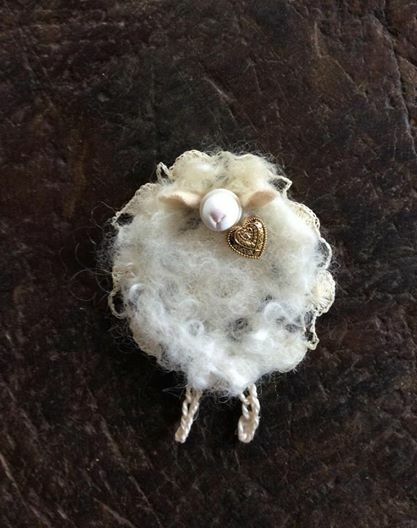 I love ewe sheep (with needle felted heart danglers)!? 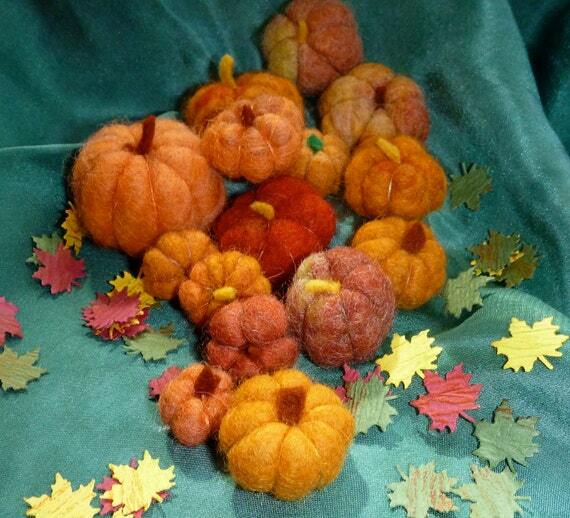 Perhaps, a flock of colorful/hand dyed wool and locks would make a fun decoration for the sheepy-themed Easter tree?? Better get busy now!! We (my daughter and I) are anxiously awaiting the arrival of Coriander’s kids… any day now!! Last October, I arranged a rendezvous between ‘Corey’ and ‘David’, a handsome and very willing Oberhasli buck, who lives on a near-by friend’s farm. She will be our only doe ‘freshening’ this Spring. As an empty nester, one dairy goat fulfills all my needs for fresh milk, cheesemaking, soapmaking and the pure pleasure of hand-milking! Corey’s ligaments are gone. Her actual due-date is Saturday, but that could go either way by a few days. I hope (pray) that we’ll experience an unassisted – normal – presentation during kidding – and not a repeat performance of last year’s triplets! The barnyard is flooded with recent snow melt, recent rainfall AND the hidden dangers of ice underlayment. It all makes for a treacherous walk back to the barn to check on Corey! Oh Spring, where are you??? My small flock of Shetlands have been sheared and I have yet to sort-out/skirt their wool fleece. 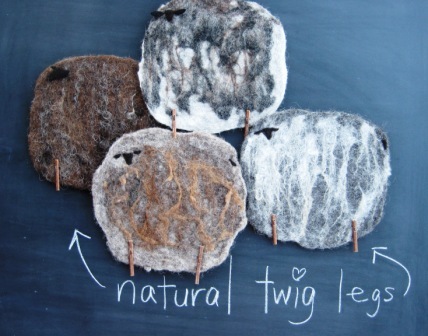 I’m thinking I’d like to felt an entire fleece (like a sheepskin rug/pelt) this Spring/Summer. I also spent an hour or so yesterday afternoon hand-shearing Brutus, my Pygora, on the stanchion. He displayed great patience with me and my ‘primping’. Today, I have a bit of clean-up work to do on him as he was starting to get annoyed with me… snip snip snip. Finally, the past few days I have been playing with the idea of an offering of classes/workshops. 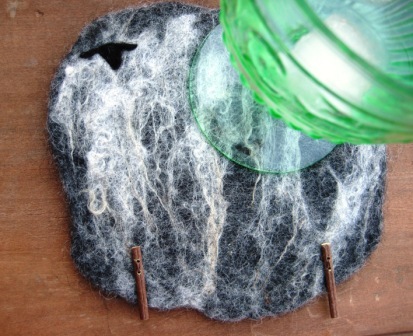 Wet felting is great therapy for me… requiring no special tools and perhaps a good place to begin a fiber ART experience? 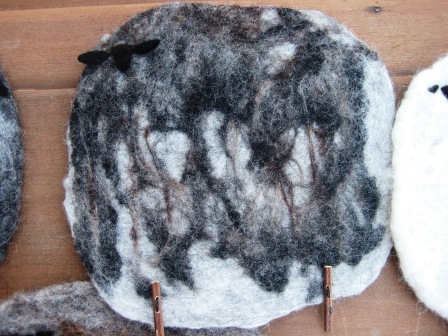 And so, I’ve arranged layers of wool into ‘sheepy’ shapes, adding a variety of natural colored wool to the surface for texture/interest and felted away. 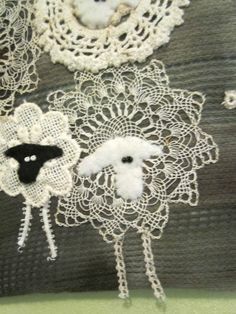 What fiber artist doesn’t l-o-v-e one more sheep?? Then I begin to add a few details/shape personality. 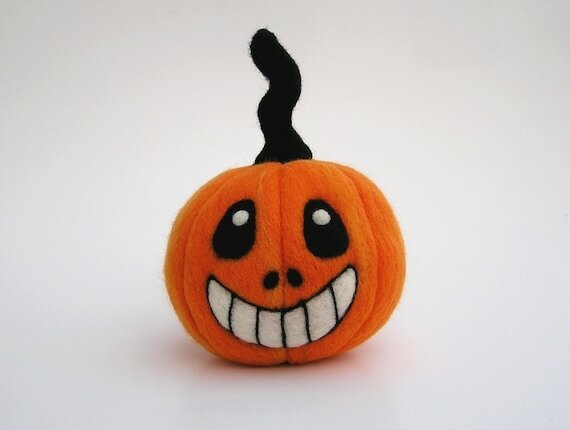 A needle felted ‘head/face’, attach wooly ears, seed beads for eyes, a nose, etc. 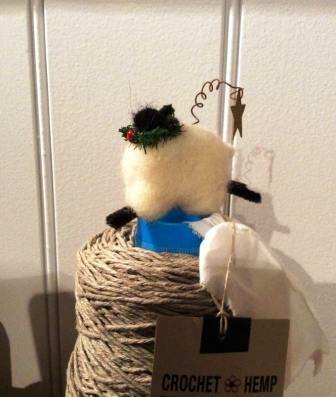 This little ewe sports a string of beads for legs…. but, use your imagination for whatever is lying around the craft room!? 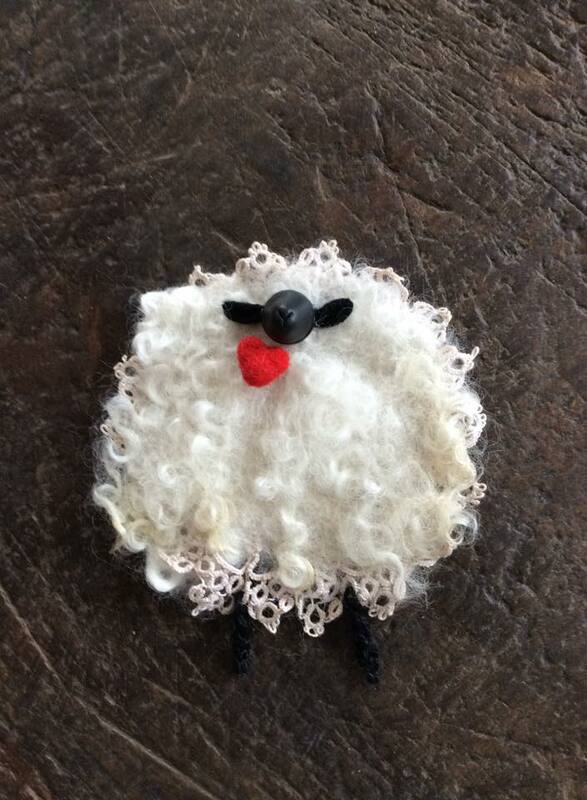 Another ‘idea’ was born with this wee little sheepie brooch/pin (for the sheep lover/fiber enthusiast). 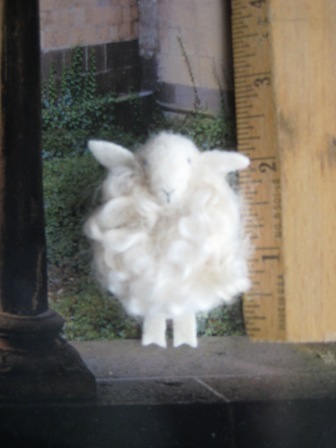 She’s completely needle felted (onto a scrap of felted wool ‘base’) with a few curly/crimpy locks/wool staples. 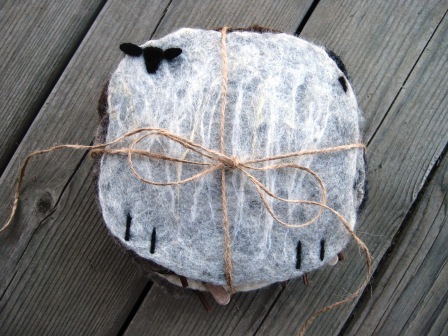 Similarly, I’ve needle felted a head, attached ears, legs, seed-bead eyes and nose. Class/workshop project??? There’s always room for one more sheep roaming the garden! 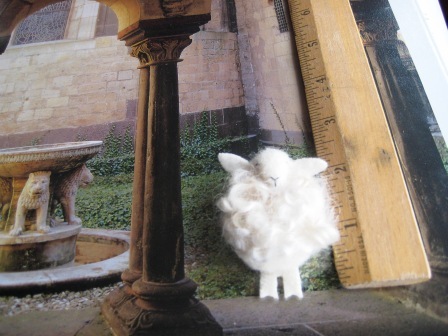 goodness, not another sheepy project?! Well, yes! 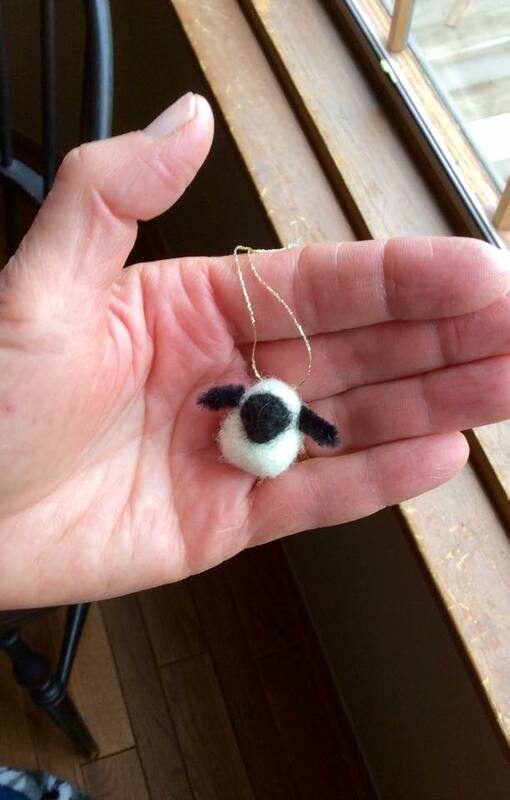 If you know me at all, I never get tired of making sheepy anything(s). This project was a little ‘gift’ to self [a belated Mother’s Day gift perhaps?]! 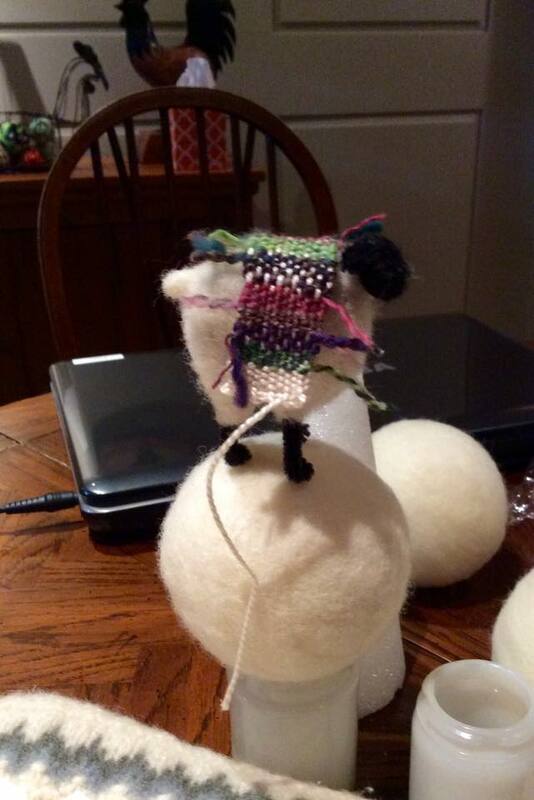 Call me a one-trick-pony, but I am passionate about making sheep! 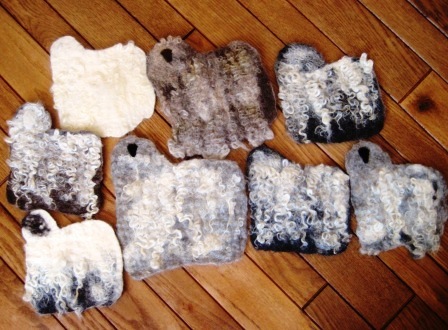 Each sheep/project is as ‘ewe’-nique as each one of my small flock of Shetland sheep. They’re such peaceable creatures… I can sit for hours in the grass with a lamb or two in my lap… and they love it! 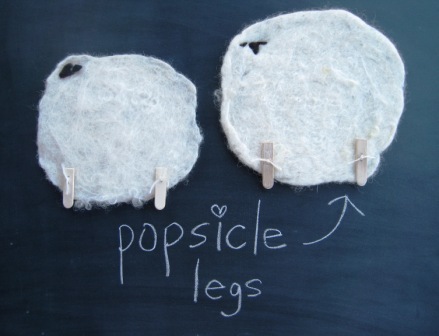 This was a very easy peasy, quickie, kid-proof wet felting project. 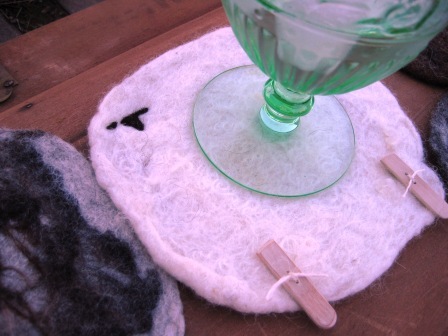 I made them for ME to be used as sheepy coasters, ya know, to protect your furniture from drinkies. 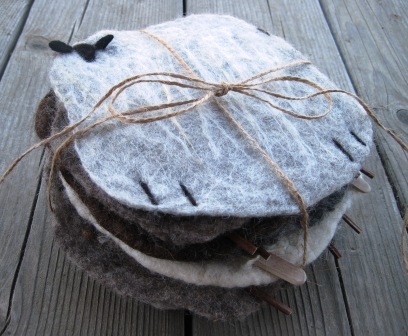 But, you may call them trivets, mug rugs, or use them as sheep ornies, package tie-ons. 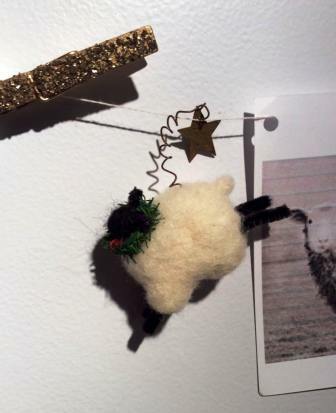 String them together for a sheepy garland/banner… whatever you like? 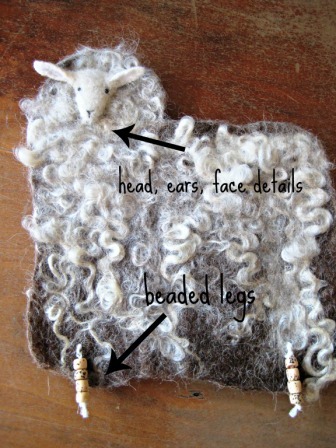 Now, what sheep-loving, fiber art, knitter, etc. wouldn’t love one of these sheepies? 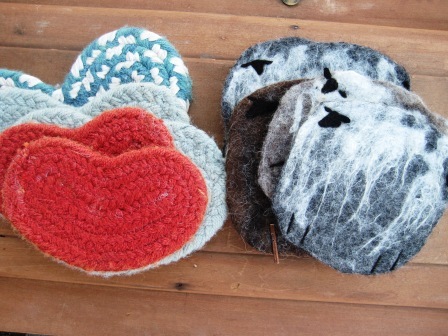 My new sheepy ‘coasters’ to replace a mish-mash of my old braided heart coasters! Look for a how-to workshop coming soon! Happy fiber’n!